Communications Department Survey - The GCS Communications Department is surveying its external audiences to assess our success in aligning understanding and support of the district's vision, services, and accomplishments. Give Me Five: Please complete a short survey that is meant to measure the effectiveness of Greenville County Schools in communicating with external audiences such as parents, community members, and business partners. The main campus of Lifelong Learning is located at our Sullivan Center campus, 206 Wilkins Street, Greenville, SC 29605. NOTE that test events open three months at a time; this calendar is provided to help you plan for future test dates. To register for a GED Test you must go to www.ged.com to enter your personal data and pay for each test. To earn a GED high school equivalent diploma you must earn a score of 145 or higher on each of the four subject tests: math, science, social studies, and reading/language arts. Lifelong Learning's Sullivan Center is an official GED® Testing Center for the Upstate. The Greenville GED Testing Center is located at the main campus at 206 Wilkins Street, Greenville, SC 29605. How long are each of the GED Test subjects? Reasoning Through Language Arts is 150 minutes (10 minutes break between parts 2 and 3) with 45 minutes for the written essay. This information can be found on www.ged.com under the heading of “Test Subjects”. More test events have been added to the testing schedule. The tests dates are posted on the Lifelong Learning home page for three months in advance with a link to a longer calendar. The dates to register are below. Payment of fees is cash only and all fees must be paid in full before starting classes. Everyone pays a $40 registration fee once a year. GED class fee is $80 for day classes. Evening class fee is $40. The GED registration, orientation, and TABE testing takes two mornings. Students take one unit at a time. Registration and orientation will take two mornings. Testing is not required. Fees are $80 per unit. Graduation for Lifelong Learning and Satellite Diploma Program students will be Thursday, May 30th, 2019 at 6:00 PM at Wade Hampton High School. Will you be in line to get your diploma? 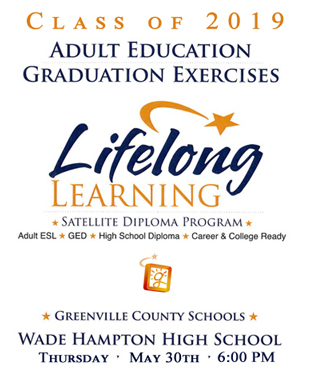 The two Greenville County Schools Adult Education Programs, Lifelong Learning and Satellite Diploma Program, will hold their 2018-19 school year graduation on May 30, 2019 at Wade Hampton High School at 6:00 pm. Family, friends, guests, and school board members will celebrate the graduates who will march during the one-hour ceremony. The graduates will have earned either a regular high school diploma or passed the national GED Test to earn a high school equivalent diploma. Lifelong Learning's Sullivan Center offers free WIN Learning and WorkKeys Upgrade Classes and free WIN Learning testing. WorkKeys® is an employment skills assessment system.